Not sure what to cook today? Don’t have time to plan menu in advance? Tired of cooking the same meals? • QUICK AND EASY RECIPES Our team cooked and perfected every recipe for more than a year. We don’t like to spend the whole day in the kitchen and everybody in our team have small kids. That’s why every recipe is not only healthy and balanced but also extremely easy and quick to cook. At the moment we have recipes in following categories: breakfasts, soups and stews, snacks, hot meals, salads, drinks, desserts and sauces. • ONE DAY MIXER This fun and useful tool will help to answer the most important question in human history – “What’s for dinner?”. Kids love to play with this tool and we have to admit adults do too. • MENU PLANNER FOR THE WHOLE WEEK For more serious matters we made a detailed planner. 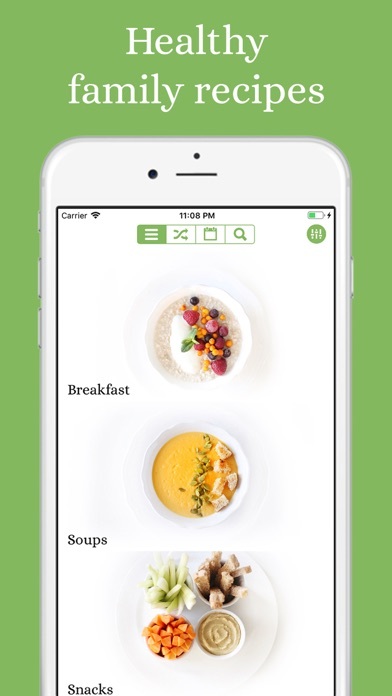 Balanced and varied menu takes your dietary requirements into account (you can select vegetarian, vegan recipes, option for people with diabetes and for people with allergies to peanuts, tree nuts, dairy, eggs, gluten, fish and seafood). 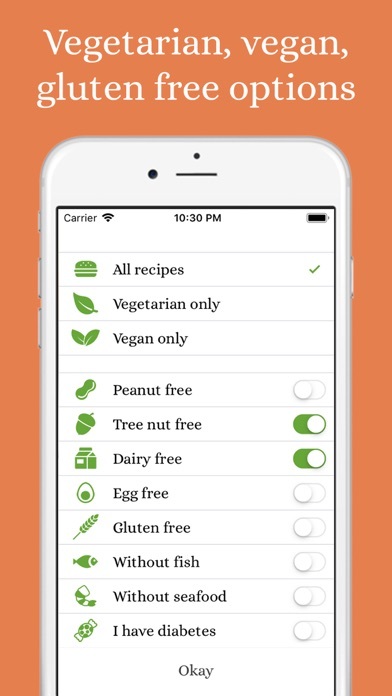 To make it easier to plan – you can enter your own recipes. • SAVING AND PRINTING YOUR MENU You can easily save, share or print menu that you have created in mixer or planner. 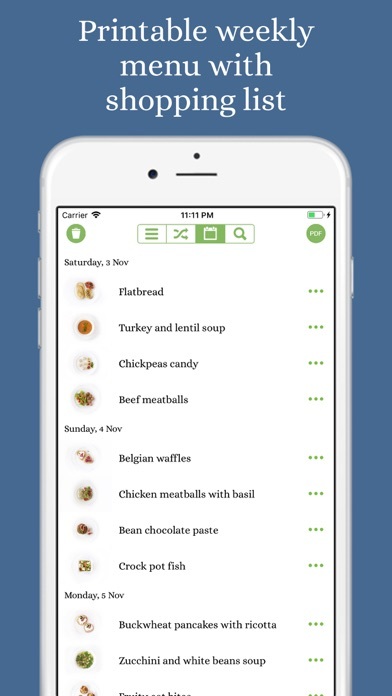 Every recipe is beautifully drawn and in the end of a PDF document there’s a shopping list for your menu. • EVERYDAY TIPS FOR PARENTS For users with kids we have prepared very useful tips. Everyday prompts from Maria Kardakova with main principles of building healthy relationships with food. • SEARCH We couldn’t left you without convenient search. 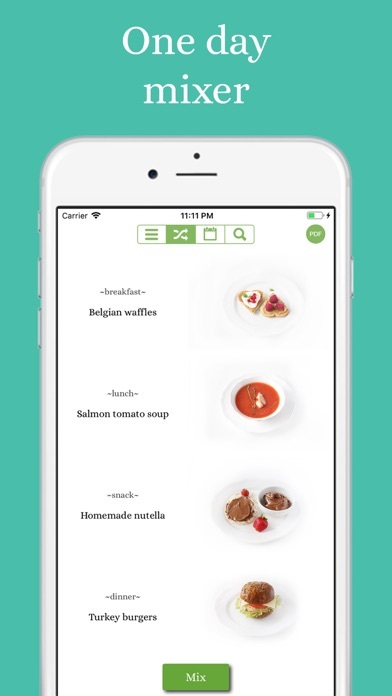 Find recipes by their names or by entering one or more ingredients. All the recipes are suitable for children from 10 months old. Yours sincerely, Maria Kardakova MSc. Registered Associate Nutritionist, Senior Associate, The Royal Society of Medicine, London.